Residents criticize a deal with Vermont Gas during the Hinesburg Selectboard meeting Monday night. 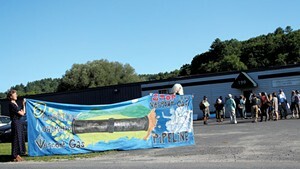 The Hinesburg Selectboard has withdrawn its agreement with Vermont Gas that laid out the conditions for constructing a controversial pipeline through the Geprags Community Park. Monday night, the board voted on the agreement for a second time. That's because residents filed a complaint alleging that the elected officials had violated Vermont's open meeting law the first time they voted on it, more than a year and a half ago. 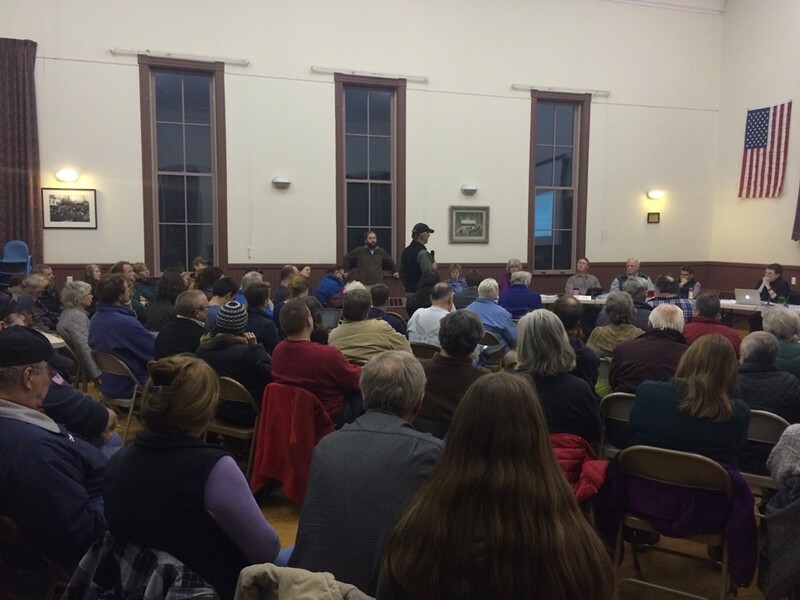 During the packed public forum, Hinesburg residents cast doubt on nearly every component of the deal, which said the town wouldn't oppose Vermont Gas being granted a permanent easement through the park for its natural gas pipeline. The company had pledged several things in return, including to protect the habitat of the rare golden-winged warbler, to pay the town $75,000 and to bring natural gas to several additional neighborhoods, if feasible. The agreement had yet to be enacted. 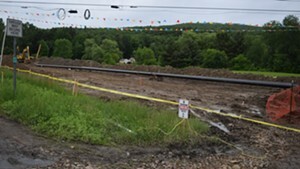 Vermont Gas determined that it would need to get the Public Service Board to grant the land through eminent domain because the parkland had been bequeathed to the town on the condition that it would be used for recreation or education. People at Monday's meeting claimed the agreement violated the wishes of the Geprags sisters, who donated the land. Others said they had canvassed people in the two trailer parks positioned to receive natural gas as part of the agreement and concluded that only about 10 percent of them had concrete pads required to connect to the gas line. Lawyer Jim Dumont drafted a letter concluding that the agreement failed to provide any benefit to the town. Dumont is representing a group of residents who plan to challenge Vermont Gas before the Public Service Board by arguing that legal precedent precludes the company from using eminent domain to seize a public park. Several audience members defended Vermont Gas and the selectboard's agreement, but they were a distinct minority. Opponents submitted a petition with several hundred signatures requesting that the board retract the agreement. Whether they will achieve their goal — to keep the pipeline out of the park — remains to be seen. Phil Pouech was one of the three members who voted to retract the agreement. He said he did so because he felt the selectboard needed to "re-earn" its constituents' trust. But Pouech suggested the five-person board would likely arrive at a similar agreement and reminded residents that the Public Service Board will ultimately make the call. His prediction: "No one is going to be happy with the final decision."